On October 18, the Crime Readers will be discussing The Beekeeper’s Apprentice, the first of twelve mysteries featuring Mary Russell and Sherlock Holmes. 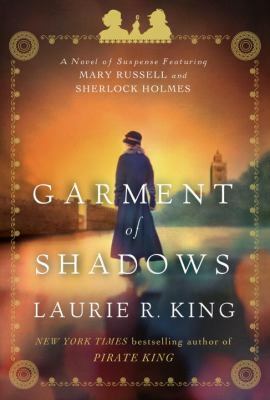 Garment of Shadows, just published, is the twelfth book in the series. In 1924, the pair are in Morocco, where Russell has been working on a film. Holmes visits his fifth cousin, the French Resident General of Morocco. Russell is injured and has amnesia, so she misses their planned rendezvous. A mute boy named Idir, English turned Arab brothers Ali and Mahmoud, and the vibrant city of Fez all enliven this adventure. Russell and Holmes try to get the Resident General to meet with rebel leader Abd el-Krim, without getting either party killed. A kidnapping, spies, and betrayal are made more challenging as Russell slowly regains her memory. I had a hard time putting this book down, and really enjoyed the Moroccan setting. For photos of Morocco and some of the characters, visit the author’s Pinterest board. For more books featuring Sherlock Holmes, see this list.